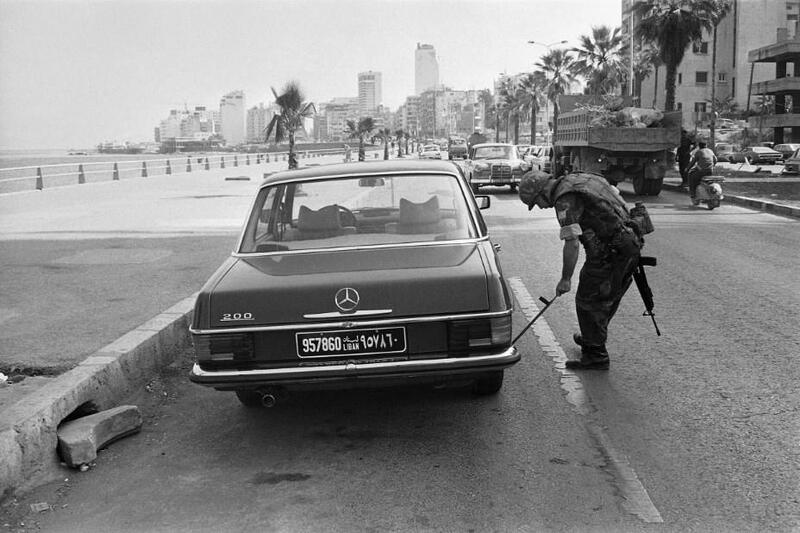 A U.S. Marine uses a mirror on a stick to check underneath a car in front of the building used as the U.S. Embassy in Beirut, Oct. 25, 1983. For the past two weeks, I have been publishing WikiLeaks cables about events during the Lebanese Civil War. But there is something I did not mention well enough: The Lebanese Civil War was more about destruction than politics. This is why in this post, the WikiLeaks cables are about the killing, the bombs, the explosions, the shelling and the fighting. You’ll find 13 cables in this last entry of the series. The title of this last post is actually a title of one of those WikiLeaks cables (Yep, we were in despair). Is it me, or do we still repeat that same sentence at least once every two to three years? Wars should not be political maneuvers. I repeat, 15 year civil wars should not be political maneuvers. OF MINISTERS MEETING EVENING MAR 5 RESULTED IN DECISION BY SOLH CABINET (BACKED BY PRES FRANGIE) TO CONTINUE IN OFFICE, ALTHOUGH MIN OF WATER AND ELECTRICITY MALIK SALAM CARRIED OUT HIS THREAT TO RESIGN AND WALKED OUT OF MEETING. STAGE THUS SEEMED SET FOR FURTHER DIMINUTION OF TENSIONS AND PROGRESSIVE RETURN TO NORMALITY MAR 6, THANKS TO TYPICALLY LEBBANESE SOLUTION IN WHICH NO PROBLEMS WERE REALLY SOLVED BUT WERE MERELY TO BE BRUSHED UNDER RUG FOR TIME BEING. 2. UNFORTUNATELY, WIDESPREAD APPREHENSION RE POSSIBLE ISRAELI RETALIATION AGAINST LEBA ON FOR LAST NIGHT’S TERRORIST OPERATIN IN TEL AVIV, FOLLOWED BY NEWS AT MID-DAY MAR 6 OF DEATH IN AUB HOSPITAL OF EX-DEPUTY MAAROUF SAAD (WHO HAD BEEN WOUNDED IN FEB 26 CLASHES IN SIDON (SEE BEIRUT 2611) HAVE CHANGED ALL THIS. PLO OFFICES IN BEIRUT APPARENTLY HAVE BEEN EVACUATED, AND FEDAYEEN ARE REPORTEDLY ON FULL ALERT IN AND AROUND COUNTRY’S 15 REFUGEE CAMPS, INCLUDING THOSE NORTH OF TRIPOLI WHERE TRIGGER-HAPPY ELEMENTS THIS MORNING ACTUALLY OPENED FIRE ON OVERFLYING LEBANESE AIR FORCE PLANES, PROBABLY ON ASSUMPTION THEY WERE ISRAELI. AS NEWS OF SAAD’S DEATH SPREAD DURING AFTERNOON, OTHER DISRUPTIVE INCIDENTS BEGAN OCCURRING AT VARIOUS POINTS IN BEIRUT, WHERE GROUPS OF HIS LEFTIST AND SUNNI MOSLEM SYMPATHIZERS (ACCOMPANIED IN SOME PLACES BY FEDAYEEN) HAVE TAKEN TO BLOCKING ROADS, BURNING TIRES, SHOOTING IN AIR, ETC. SIDON REPORTEDLY IS AGAIN GRIPPED BY TENSION, WITH LARGE NUMBERS OF “ARMED ELEMENTS” (I.E., FEDAYEEN AND THEIR LEFTIST ALLIES) HAVING REOCCUPIED STREET BARRI- CADES AND POSITIONS ON ROOFTTPS. LEBANESE ARMY AND INTERNAL SECURITY FORCES HAVE CANCELLED ALL LEAVES AND UNITS ARE CURRENTLY ENGAGED IN TRYING CLEAR CROWDS AND BARRICADES FROM SEVERAL ARTIERIES IN BEIRUT, INCLUDING ROAD TO AIRPORT. MOST SHOPS AND BUSINESSES CLOSED EARLIER THAN USUAL, AND LATE AFTERNOON RUSH-HOUR TRAFFIC AP- PEARS LESS THAN NORMAL. GENERATED INTERNALLY OR BY ISRAELIS, OR BOTH–IS STILL TO COME. I HAVE TAKEN PRECAUTIONOF ADVISING EMBASSY’S AMERICAN STAFF TO AVOID UNNECESSARY MOVEMENT AT LEAST DURING NIGHT MAR 6-7. 2. CLASHES, WHICH BEGAN TUESDAY AND SPUTTERED ALONG WEDNESDAY. PICKED UP CONSIDERABLE STEAM AFTERNOON JUNE 25 AND CONTINUED THROUGH HOURS OF DARKNESS.SECURITY FORCES PERSISTING IN EFFORTS TO CONTAIN SITUTATION AND APPARENTLY HAVE ORDERS TO OPEN FIRE ON FRANC TIREURS, USING AS MUCH FIRE POWER AS NECESSARY TO SILENCE SNIPERS. LEBANESE ARMY SOURCE REPORTS CASUALTY FIGURES OF 11 KILLED, 46 WOUNDED AND WE UNDERSTAND SUBSTANTIAL MATERIAL DAMAGE HAS OCCURRED IN AFFECTED AREAS. SAME ARMY SOURCE TOLD DATT THAT UP TO 60 ROUNDS OF 120MM MORTAR FIRE WERE RECEIVED IN AIN RUMMANNEH DURING NIGHT OF 25/26 JUNE. SOME STRAY ROUNDS FELL OUTSIDE AIN RUMMANNEH AND RELIABLE LEBANESE OBSERVER RE PORTS SHELL OR ROCKET, WHICH FAILED TO EXPLODE, STRUCK WALL OF MAIN MILITARYS HOSPITAL. SAME SOURCE COUNTED TWENTY HEAVY EXPLOSIONS DURING HALF HOUR. 4. PHALANGE APPARENTLY HAS NOT RPT NOT BEEN ACTIVE PARTICIPANT IN RECENT FIGHTING. LATEST REPORTS INDICATE THAT, ALTHOUGH MOBILIZED AND IN POSITION IN NEIGHBORHOODS WHICH THEY CONTROL, PHALANGE MILITIAMEN ARE PRIMARILY OBSERVERS IN CURRENT CLASHES. IT IS IN OUR VIEW, EXTREMELY UNLIKELY THAT PHALANGIST LEADERS WOULD SEEK CLASHES AT THIS TIME. SO FAR AS WE DETERMINE, PHALANGIST FORCES ARE CRITICALLY SHORT OF CERTAIN KINDS OF AMMUNITION, ESPECIALLY MORTARS ROUNDS AND BELTED MACHINEGUN AMMO, POSSIBILTIY WHICH IS SOURCE OF CONCERNTO SECURITY OFFICIALS, EXISTS THAT PHALANGISTS AND OTHERS COULD BE DRAWN IN, IF CLASHES CONTINUE. SHIP IN PAST TEN DAYS MAY HAVE FORCED ‘ARAFAT TO TAKE MEASURES WHICH HE HAS HERETOFORE BEEN RELUCTANT TO ADOPT. 6. SO FAR AS WE ARE AWARE, ALL AMCITS ARE SAFE. BOTH LEB- ANESE AND FOREIGN RESIDENTS, HOWEVER ARE STILL BEING WARNED TO AVOID AIN RUMMANNEH/SHIAH AREAS AND OLD DAMASCUS ROAD THROUGH FURN AS SHUBAK IS CLOSED TO TRAFFIC. 1. FIGHTING TOOK PLACE IN MANY OF THE USUALLY HOT QUARTERS OF EAST BEIRUT NIGHT OF SEPT 26-27 AT ABOUT SAME INTENSITY AS PREVIOUS NIGHT. SLOW DROP IN LEVEL OF STRIFE THUS HOPEFULLY REMAINS PATTERN, BUT PERSISTENCE OF FIGHTING CAUSING SOME OBSERVERS TO FEAR ROUND 4 WILL DRAG ON FOR SOME TIME. 2. AS OF 1200 HOURS (LOCAL) SEPT 27, USUAL DAY- LIGHT LULL IN HEAVIEST FIGHTING PREVAILS. SNIPERS ARE CITY’S MAIN DAYTIME PROBLEM. TRAFFIC IS UP EVEN FROM IMPROVED LEVEL OF DAY BEFORE. AIR- PORT ROAD IS OPEN. AIRPORT ACTIVITIES ARE MORE OR LESS NORMAL, DESPITE CONTINUING FUEL SHORTAGE. CITY IS MAKING DETERMINED EFFORT TO NORMALIZE. 3. ACCORDING TO INTERNAL SECURITY HQ, TREND TOWARD DISARMING OF BARRICADES IS OCCURRING AS POLICE AS- SUME CHARGE OF MANY OF THESE STRONGPOINTS FROM PRIVATE MILITIAMEN. BUT THIS IS CLEARLY A CON- TINUING PROBLEM FOR HARASSED INTERNAL SECURITY FORCES. APPARENTLY, IT IS NOT RPT NOT TRUE THAT ARMY HELPING INTERNAL SECURITY IN CITY, CONTRARY TO SEPT 25 ANNOUNCEMENT (REFTEL), ALTHOUGH LOANS OF ARMY’S ARMORED VEHICLES TO POLICE–A LONG- STANDING PRACTICE–HAVE BEEN STEPPED UP. 4. ANOTHER HOPEFUL SIGN IS THAT THE DORMANT CEASE- FIRE COMMITTEE COMPOSED OF SECURITY FORCES REPRE- SENTATIVE, PLO REP TEWFIQ SAFADI, AND DANY CHAMOUN (WHO REPLACED HIS BROTHER) WILL BE BEEFED UP WITH A PHALANGE REP AND A MEMBER OF RAYMOND EDDE’S NA- TIONAL BLOC PARTY. 5. CEASEFIRE VIOLATIONS ALMOST CERTAINLY BEING COMMITTED BY BOTH SIDES. PREDICTABLY, MOSLEMS AND LEFTISTS BLAME PHALANGE STUBBORNESS WHILE CHRISTIANS SEE MALEVOLENT HAND OF LIBYANS AND OTHERS BEHIND EXTREME LEFT. THE PREVIOUSLY RE- PORTED FIGHT BETWEEN PHALANGE AND LEFTIST PPS IN METN AREA IS TAKEN BY CHRISTIANS AS SIGN OF LEFTIST PLOT TO KEEP TROUBLE BOILING. THIS BATTLE STILL CONTINUING AT SOMEWHAT LOWERED INTENSITY WITH IN- TERNAL SECURITY NOW TRYING TO DISARM MILITANTS OF PPS. BEIRUT PRESS TODAY, HAS REKINDLED POLITICAL TEMPERA- TURE. HE SAID THERE WOULD BE NO RECONCILIATION WITH THE PHALANGE, WITH HE CLAIMED WAS POLITICALLY ISOLATED, BEFORE BASIC LEFTIST DEMANDS ARE MET. HE ALSO ATTACKED LONG-TIME MOSLEM LEADER SAEB SALAAM FOR “WISHING TO EXTEND HIS DOMINION OVER THE MOS- LEMS OF BEIRUT.” JUMBLATT SAID THESE MOSLEMS WERE MORE PROPERLY REPRESENTED BY JUMBLATT HIMSELF. THESE REMARKS MAKING OBSERVERS WONDER WHAT THE ATMOSPHERE WILL BE WHEN “NATIONAL DIALOGUE COMMITTEE” RENEWS TALKS SEPT 29. 7. A PARTICIPANT IN LAST THURSDAY’S OPENING SESSION OF THE “DIALOGUE” TELLS US THAT THE 20-MAN GROUP MAY BE ENLARGED, THOUGH NOT NECESSARILY BEFORE THE SEPT 29 SESSION. PRIMIN KARAME HAS BEEN CHARGED WITH EXPLORING THE POSSIBILITY OF EXPANSION THROUGH PRIVATE CONTACTS. SAME SOURCE TELLS US THAT REASON SECOND SESSION NOT SCHEDULED UNTIL SEPT 29 WAS TO AVOID SPECTACLE OF DEADLOCK–A STRONG POSSIBILITY IN EARLY SESSIONS–WHILE FIGHTING HAD STILL NOT DIED DOWN. COUNTRY, THE MOUNTAIN AREAS, AND THE BAKAA VALLEY ARE NOW WELL-SUPPLIED FROM MEDRECO RE- FINERY NEAR SIDON. IPC REFINERY IN TRIPOLI IS MAKING SOME DELIVERIES IN THAT AREA. BUTANE AND AVIATION FUEL TANKER SHIPS REMAIN OFF SHORE. 9. IN OTHER AREAS OF THE ECONOMY, PORT AUTHORITIES HAVE ASKED WORKERS TO REPORT TO DUTY ON MON, SEPT 29. BECAUSE BANKS HAVE NOW BEEN CLOSED FOR TEN DAYS, MONEY IS IN SHORT SUPPLY. MERCHANTS ASSOCIATION HAS ASKED GOVT INDEMNIFICATION FOR LOSSES. TWENTY-FIVE THOUSAND LEBANESE REFUGEES NOW REPORTEDLY IN SYRIA. 10. TH BEST OF EMBASSY KNOWLEDGE, ALL AMCITS ARE SAFE EXCEPT AS PREVIOUSLY REPORTED. IBM HAS CON- TINGENCY PLANS TO EVACUATE SOME EMPLOYEES ON MON. IF BEIRUT OFFICE IS STILL UNABLE TO FUNCTION. SMALL SALES STAFF WILL WORK OUT OF PARIS AND FINANCIAL OPERATIONS WILL MOVE TO KUWAIT. SUMMARY: SECTIONS OF BEIRUT WITNESSED HEAVY CLASHES NIGHT OF OCT 7-8 AND INTO OCT 8. PROGRESS ON THE POLITICAL FRONT AWAITS TOMORROW’S SCHEDULED MEETING OF THE “DIALOGUE”. HOW- EVER, AS BEFORE, PARTICIPATNS IN THAT MEETING MAY HAVE TO FOCUS ON SECURITY PROBLEM IF MAJOR CLASHES OCCUR AGAIN TONIGHT. END SUMMARY. 1. A RESUMPTION OF HEAVY SHOOTING AND EXPLOSIONS OCCURRED NIGHT OF OCT 7-8 IN SEVERAL PARTS OF BEIRUT, CONTINUING INTO OCT 8. CHIYAH AND AIN EL-RUMANNEH WERE THE SCENE OF CLASHES WHICH AT TIMES RIVALED IN INTENSITY THE HOTTEST PERIOD A FEW WEEKS AGO. A MORTAR ROUND KILLED AND WOUNDED MANY PEOPLE ON STREET IN FRONT OF BAKERY IN MOSLEM AREA DURING EARLY MORNING HOURS, RAISING EMOTIONS AMONG CITY’S MOSLEMS. AT MID-MORNING TODAY THE FIGHTING SUBSIDED, BUT IT PICKED UP AGAIN LATER IN CITY CENTER WHERE CLASHES CONTINUE AS OF 1400 HOURS (LOCAL). A CURFEW WAS REES- TABLISHED COVERING ALL OF BEIRUT STARTING TONIGHT. THE ELABOR- ATELY CONSTRUCTED CEASEFIRE ARRANGEMENTS ARE IN JEOPARDY AS MANY PRIVATE MILITAMEN ARE REPORTED PREPARING TO RETURN TO BARRICADES. 2. REPORTS FROM NORTH LEBANON INDICATE CONTINUED FIGHTING IN THE ZGHORTA AREA. INTERNAL SECURITY HQ IN BEIRUT TOLD US AT 0900 HOURS (LOCAL) TODAY THAT THE NORTH WAS QUIET AS OF THAT TIME, BUT PICTURE IS MURKY.KIDNAPPINGS AND EXCHANGES OF FIRE BETWEEN MOSLEM AND CHRISTIAN AREAS ARE KEEPING TENSIONS HIDH THERE. THE FLUCTUATING CLASHES ARE PROVING HARD TO STOP DESPITE THE PRESENCE OF THE ARMY. MEETING OF BUSINESS AND LABOR LEADERS TO DISCUSS OPERATING PRO- BLEMS UNDER CURRENT SECURITY CONDITIONS WAS CANCELLED. CATHOLIC EDUCATION LEADERS MET YESTERDAY TO CONSIDER OPENING OF CATHOLIC SCHOOLS. ANNOUNCEMENT SAID A SPECIAL COMMITTEE WOULD DECIDE ABOUT OPENING OF SCHOOLS ON A REGION BY REGION BASIS AS SECURITY CONDITIONS PERMIT. ALTHOUGH NEWSPAPERS ANNOUNCED ABOUT A WEEK AGO THAT LOCAL ARABIC SCHOOLS WOULD OPEN ON SCHEDULE ON OCT 15 IF SECURITY CONDITIONS PERMIT, WE UNDERSTAND MINISTRY OF EDUCATION IS NOW CONSIDERING POSTPONE- MENT. TO PERMIT CONTINUATION OF ESSENTIAL SERVICES, THE NEW CURFEW EXEMPTS HOSPITAL EMPLOYEES, BAKERY WORKERS, AND SIMILAR PERSONNEL. SO FAR, ROUND FOUR HAS NOW SERIOUSLY DIS- RUPTED MOST ECONOMIC ACTIVITIES FOR THREE WEEKS. 1. SUMMARY: FIGHTING ESCALATED SHARPLY IN BEIRUT LATE OCT. 24 AND NIGHT OCT. 24-25. IT CONTINUES AS OF 1100 HOURS (LOCAL) OCT. 25, AT SLIGHTLY REDUCED INTENSITY. CAPITAL’S ECONOMY REMAINS VIRTUALLY PARALYZED. ALL THREE SUB-COMMITTEES OF “NATIONAL DIALOGUE” MET YESTER- DAY. PARLIAMENT IS SCHEDULED TO CONVENE TODAY, AND IF IT DOES MEET INTEREST CENTERS ON WHETHER KARAME WILL SPEAK AGAIN ON RECORD OF HIS GOVERNMENT. END SUMMARY. 2. AN UPSURGE OF VIOLENCE TOOK PLACE IN BEIRUT LATE OCT. 24 AND NIGHT OF OCT. 24-25. FIGHTING ERUPTED BETWEEN CHIYAH (SHIITE) AND AIN EL RUMANEH (CHRISTIAN), TWO QUARTERS THAT HAVE BEEN INVOLVED IN CLASHES ONLY SPORADICALLY DURING LAST TWO WEEKS OR SO. FIGHTING ALSO CONTINUED AROUND RAS EL-NABA, SOUTH OF CITY’S CENTER, AND BETWEEN LAILEKE (MIXED MOSLEM- CHRISTIAN) AND HADATH (CHRISTIAN) IN SOUTHERN OUTSKIRTS OF CAPITAL. IN ADDITION, THREE FACTORIES WERE BURNED IN DIFFERENT AREAS – THE SECOND NIGHT THIS PRACTICE HAS OCCURRED, GIVING RISE TO SPECULATION THAT CERTAIN UNKNOWN GROUPS ARE DELIBERATELY AIMING AT ECONOMIC SABOTAGE. 3. BY MORNING OCT. 25, THE FIGHTING HAD SUBSIDED SLIGHTLY INTO WHAT AN OBSERVER AT INTERNAL SECURITY HQ IN BEIRUT CALLED A “RELATIVE CALM, BUT NOT A REAL CALM.” SNIPERS REMAINED ACTIVE IN VARIOUS PLACES AND THERE CONTINUED TO BE EXCHANGES OF FIRE, WHICH AT LAST REPORT AS OF 1100 HOURS (LOCAL) HAD BECOME SERIOUS IN KANTARI AREA OF WEST CENTRAL BEIRUT. OUTLYING ROADS ANDPROTECTING FUEL DEPOTS AND GRAIN MILLS IN THE VICINITY OF DORA. 5. THE BEKAA VALLEY REMAINS TENSE, BUT APPARENTLY THE ARMY IS STILL ABLE TO KEEP THE SITUATION UNDER CONTROL. 6. ECONOMY OF BEIRUT REMAINS VIRTUALLY PARALYZED FOR SEVENTH DAY. IN MEETING YESTERDAY, CHAMBER OF COMME CE EXECUTIVE COMMITTEE EXPRESSED CONCERN AT FACT THAT FACTORIES AND OTHER BUSINESS ESTABLISHMENTS ARE INCREASINGLY TARGET OF SABOTEURS. 7. YESTERDAY’S MEETING OF THE POLITICAL SUB-COMMITTEE OF THE “NATIONAL DIALOGUE” ASSIGNED EDMOND RABBATH, ONE OF ITS MEMBERS WHO SPECIALIZES IN CONSTITUTIONAL LAW, TO DRAW UP A SUTDY ON CONFESSIONALISM, ITEM NO. 1 ON THE SUB-COMMITTEE’S AGENDA. THE CONOMIC AND SOCIAL SUB-COMMITTEES ALSO HELD A JOINT SESSION YESTERDAY WHICH REESULTED IN A DECISION TO INVITE WRITTEN OPINIONS FROM VARIOUS ECONOMIC AND SOCIAL ORGANS, SUCH AS THE BEIRUT CHAMBER OF COMMERCE AND INDUSTRY AND THE LABOR FEDERATION. THE MEMBERS ALSO AFFIRMED THEIR BELIEF THAT THE WORK OF THESE TWO SUB-COMMITTEES DEPENDS ON PROGRESS IN THE POLITICAL SUB-COMMITTEE. 8. POLITICAL INTEREST CENTERS ON TODAY’S SCHEDULED PARLIAMENTARY SESSION. THERE IS CONSIDERABLE QUESTION WHETHER THE SESSION WILL OCCUR, NOT ONLY BECAUSE IN- SECURE CONDITIONS MAY FORCE DEPUTIES TO STAY AWAY BUT ALSO BECAUSE SOME POLITICAL LEADERS ARE TRYING TO KEEP THE EMERGING FEUD BETWEEN PREMIER KARAME, ON ONE HAND, AND PRESIDENT FRANGIE AND INTERIOR MINISTER HCAMOUN, ON OTHER, FROM BREAKING IRRETRIEVABLY INTO THE OPEN. IT ALMOST ERUPTED LAST THURSDAY WHEN KARAME DEFENDED HIS RECORD AS HEAD OF GOVERNMENT AND CRITICIZED CHAMOUN AND FRANGIE IN INDIRECT FASHION. 1. COMBAT CONTINUED THROUGH NIGHT OF OCT. 27-28 AND UP TO LATE MORNING TODAY, OCT. 28, IN MANY QUARTERS OF BEIRUT. LEVEL OF FIGHTING VARIES CONSIDERABLY. SEVERAL OF THE TRADITIONALLY ACTIVE AREAS IN EAST BEIRUT HAVE BEEN INVOLVED, AS WELL AS THE INTERNATIONAL HOTEL SECTION IN THE WEST CENTRAL PART OF CITY. FIGHT IN HOTEL AREA IS IN ITS THIRD DAY AND PITS KATAEB AGAINST NASSERITES OF IBRAHIM QULAYLAT AND PALESTINAIANS. LATTER ARE ADVANCING FROM KANTARI REGION (UP HILL FROM HOTELS) AND ALSO FROM AIN MREISSEH QUARTER FURTHER WEST (NEAR U.S. EMBASSY). OUR CURRENT IMPRESSION IS THAT KATAEB AT DISADVANTAGE AND LOSING GROUND. 2. EFFORTS STILL UNDERWAY TO PUT SUBSTANCE INTO LATESTCEASEFIRE APPEAL. KARAME HAS MET WITH SUCCESSION OF POLITICAL LEADERS AND ANNOUNCED ABOUT NOON TODAY THAT A HIGH-LEVEL “SECURITY COMMITTEE” IS TO BE FORMED WHICH WILL SIT IN THE PRIME MINISTER’S OFFICE UNTIL THE CEASEFIRE IS OBSERVED. THE COMMITTEE CONSISTS OF HIMSELF, SAEB SALAM, ABDALLAH YAFI, RAYMOND EDDE, PIERRE GEMAYEL, ADEL OSSEIRAN, PHILIPPE TAQLA, GHASSAN TUEINI, KAMAL JUMBLATT, AND CAMILLE CHAMOUN. IN ADDITION, MARONITE PATRIARCH KREISH YESTERDAY ISSUED APPEAL TO ABIDE BY CEASEFIRE, AND TODAY WAFA PLO NEWS AGENCY) SUPPORTED PATRIARCH’S CALL IN STATEMENT OF ITS OWN. SUMMARY: GENERALIZED AND HEAVY CLASHES OVERNIGHT AND CONTINUING INTO NOVEMBER 1, HAVE PERSISTED DESPITE PRIMIN’S FRANTIC EFFORTS TO ARRANGE AN EFFECTIVE CEASE-FIRE (SEVERAL TIMES NIGHT OCT 31/NOV 1). SAVAGERY AND MUTUAL SELF-DESTRUCTION AMONG ARMED BANDS HAS ACHIEVED MOMENTUM AND LIFE OF THEIR OWN WHICH RENDERS POLITICAL EFFORTS THUS FAR INEFFECTIVE OR EVEN IRRELEVANT. GROWING VOLUME REPORTS PLACE ARMED BANDS FROM SYRIAN TERRITORY IN BEKAA VALLEY WHERE ZAHLE IS ONCE AGAIN HOT SPOT. PRIMIN KARAME IS MEETING WITH FAITHFUL FEW OF SECURITY COMMITTEE, BUT THIS IS NOT EXPECTED TO AFFECT DEEPENING DESPAIR AND MANY FEAR THAT KARAME, HIS LINES TO CHAMOUN AND GEMAYEL THREATENED, MAY NOT RPT NOT HAVE IT IN HIM FOR ANOTHER COLLEGE TRY. END SUMMARY. AND LAYLAKI. IN SUMMARY, DESPITE PERSISTING EFFORTS TO IMPOSE A CEASE-FIRE, WE NOW BACK TO SQUARE MINUS ONE ON SECURITY SCENE. 2. DURING EXCHANGES OF MORTAR AND OTHER HEAVY WEAPON FIRE LAST EVENING, SEVERAL ROUNDS FELL IN VICINITY OF SABRA/SHATILA PALESTINIAN REFUGEE CAMP (IN NEARBY MARTYR’S CEMETARY, WE ARE TOLD). UNTSO SOURCE STATIONED NEAR KUWAIT EMBASSY TRAFFIC CIRCLE INFORMED UN SECURITY OFFICIALS IN EARLY MORNING THAT NOISE AT THAT LOCATION WAS GREATER THAN PREVIOUSLY EXPERIENCED IN THAT AREA. UN OFFICIALS PRESENTLY ATTEMPTING TO DETERMINE WHETHER EXCHANGES HEAVIER THAN HERETOFORE OR CLOSER. UNRWA OFFICIAL INFORMED EMBOFF MORNING NO. 1 THAT CAMPS NEAR BEIRUT ARE GENERALLY QUIET, ALTHOUGH UNRWA ACCESS TO AREAS LIMITED. HE SAID PALESTINIANS HAVE MOVED MOST FEDAYEEN COUT OF SABRA/SHATILA AND THAT ONLY RESIDENTS AND ARMED MILITIA REMAIN. HE NOT RPT NOT CERTAIN WHERE MAINLINE UNITS HAVE GONE BUT BELIEVES THAT MOVE WAS EFFORT TO AVOID DRAWING DIRE UPON CIVILIAN CAMP POPULATION. IT IS EQUALLY CONCEIVABLE, HOWEVER, THAT FEDAYEEN WERE WITHDRAWN SO THAT THEY WOULD NOT BE PINNED DOWN IN CAMP, SHOULD DECISION TO COMMIT PALESTINIAN FORCES TO BATTLE HAVE TO BE TAKEN. ZAHLE AND THAT THESE FORCES WERE INVOLVED IN THE FIGHTING AGAINST THE CHRISTIAN INHABITANTS AND THE LEBANESE ARMY UNITS THERE. TO DATT, THESE REPORTS CONSTITUTE CONFIRMATION OF INFILTRATION FROM SYRIA. 4. CONTINUATION OF CIVIL STRIFE HAS LED MANYLOCAL OBSERVERS TO EXPRESS CONCERN THAT PRIMIN KARAME WILL REACH THE END OF HIS ROPE MOMENTARILY. WE WERE ABLE TO REACH PRIMIN’S OFFICE AT APPROX. 1020 HOURS THIS MORNING AND OFFICE DIRECTOR MUSSEIKI INFORMED US THAT KARAME, WHO SPENT SLEEPLESS NIGHT AT SERAIL, WAS AT TIME OF CALL MEETING WITH “SEVERAL MEMBERS” OF SECURITY COMM. MUSSEIKI WAS RELUCTANT TO IDENTIFY THOSE PRESENT (WHICH WE TAKE TO INDICATE THAT CHAMOUN, GEMAYEL AND JUMBLAT HAVE NOT RPT NOT JOINED FORLORN CONVOCATION), BUT HE INDICATED THAT KARAME HAD BEEN “IN CONTACT” WITH ALL SIDES, “INCLUDING THE PHALANGISTS.” MUSSEIKI SAID THAT KARAME HAD ARRANGED SEVERAL CEASE-FIRES OVERNIGHT, BUT ADMITTED THAT NONE OF THEM HAD BEEN “FULLY EFFECTIVE” (A GROSS UNDERSTATEMENT). MAJOR EFFORT WAS ALLEGEDLY AGREEMENT BY ALL PARTIES TO CEASE FIRING AS OF 2130, OCTOBER 31. WHEN THAT HOUR ARRIVED, HOWEVER, EXCHANGES INTENSIFIED RATHER THAN CEASING. 5. KARAME’S RELATIONSHIPS WITH KEY CHRISTIAN LEADERS APPEAR TO HAVE WORSENED SUBSTANTIALLY. LAST NIGHT, KARAME GAVE A TELEVISION INTERVIEW IN WHICH HE SUGGESTED PHALANGE RESPONSIBILITY FOR THE CONTINUED VIOLENCE, BY INDICATING SNIPING FROM THE HOLIDAY INN AND ASHRAFIYAH WERE PROXIMATE CAUSES. PHALANGISTS HAVE NATURALLY REACTED ANGRILY WITH THEIR DAILY, “AL AMAL” DETAILING ALLEGED CEASE-FIRE VIOLATIONS AND PROVOCATIONS FROM OTHER SIDE AND CALLING UPON KARAME TO REMAIN AN “ARBITER” AND NOT BECOME A PARTY. THIS LATEST ALTERCATION HAS PROBABLY GIVEN A FURTHER SHOVE TO WIDENING GAP BETWEEN KARAME AND CHAMOUN, WHO WERE ALREADY RUMORED TO ON VERY BAD TERMS. IF THIS DANGEROUS TREND CONTINUES, KARAME COULD END UP WITH ONLY THE MOST TENUOUS CONTACTS WITH CHAMOUN AND GEMAYEL, AS WELL AS FRANGIE. 6. AT 1330 TODAY I TELEPHONED KARAME TO TELL HIM WE HAD DECLARED LEBANON DISASTER AREA TO GET SOME MEDICINES. TOLD HIM WE THOUGHT DOING FINE, PATRIOTIC JOB UNDER TERRIBLE CIRCUMSTANCES, ETC. FIVE MINUTE EXCHANGE DID NOT GIVE ME IMPRESSION HE PLANNING RESIGN AND HIS MOOD APPEARED TO BE ONE OF TOUGH SCRAPPER. 7. IN GENERAL, WE FEEL CONFIDENT IN STATING THAT TODAY, THERE ARE NO RPT NO OPTIMISTS IN LEBANON, UN- LESS THEY ARE AMONG THE GROWING NUMBER OF LOOTERS OPERATING IN ABANDONED (AND SOME STILL OCCUPIED) NEIGHBORHOODS OF THE CITY. 8. ALL AMCITS ARE SAFE AS FAR AS WE AWARE, WITH EXCEPTION THOSE REPORTED SEPTELS AND REV. JIRAIR SOGOMIAN, CHAPLAIN HAIGAZIAN COLLEGE WHO WAS SHOT IN HAND OCT. 31 ON STREET NEAR COLLEGE. HE WAS ADMITTED AUB HOSPITAL AND IS IN GOOD CONDITION. FAMILY NOTIFIED. 1. SUMMARY: LIKE A BOXER PUNCH-DRUNK FROM FOUR GRUELING ROUNDS OF PUNISHMENT, BKEIRUT CONTINUES NOV 6 TO RISE FROM THE CANVAS; THE LEGS ARE WOBBLY, THE VISION BLURRED. THERE ARE RISING HOPES BUT AS YET LITTLE CONFIDENCE, THAT THE CITY WILL NOT HAVE TO ANSWER THE BELL FOR ROUND 5. END SUMMARY. 2. BEIRUT AND MOST OF LEBANON ENJOYING ANOTHER DAY OF CALM NOV6, WITH ONLY RARE BURSTS OF MACHINEGUN FIRE TO MAR THE FAMILIAR CIVILIAN NOISE POLLUTION OF HAMRA AND OTHER REAWAKEN- ING COMMERCIAL DISTRICTS. TWO ROCKETS WERE FIRED INTO ASHRAFIYEH OVERNIGHT, BUT GENERAL ABSENCE OF BACKGROUND EXPLOSIONS ALMOST EERIE. DESPITE CALM, LEBANESE VENTURING OUT IN FALL FINERY WEAR A WARY EXPRESSION AND COMPETENT OBSERVERS ARE NOT RPT NOT PREPARED TO DECLARE PEACE IN OUR TIME. SOME, IN FACT, ARE PREDICITING A RETURN TO ARMS AS EARLY AS NEXT MONDAY. TRIPOLI REPORTEDLY IS TENSE FOLLOWING DISCO- VERY OF UNIDENTIFIED BODY, BUT WAVE OF KIDNAPPING IN BEIRUT IS APPARENTLY FINISHED AS OF THIS REPORT. ALESTINIANS) CONTINUED ITS WORK AND FOCUSSED NOV 5 ON ENDING KID- NAPPING AND SURRENDERING PERPETRATORS TO CRIMIAL COURTS. LEBANESE ARMY, WHICH HAS ASSUMED RESPONSIBILITY FOR INTER- NATIONAL ROADS, ANNOUNCED ORDERS TO FIE UPON ARMED ELEMENTS ON THESE THOROUGHFARES AND ACTUALL ARRESTED 20 PERSONS IN HAZMIYEH YESTERDAY WHEN THEY ATTEMPTED TO SET UP A ROADBLOCK. 4. NOW THE BAD NEWS. (A) PHALANGIST ELEMENTS REMAIN THIS MORNING IN HOLIDAY INN AND CANADIAN MILITARY ATTACHE REPORTS THAT ENTRY IS FORBIDDEN TO ANYONE NOT HOLDING A PASS FROM THE PHALANGE HEADQUARTERS. BOTH SIDES ARE ACCUSING THE OTHER OF BAD FAITH IN OBSERVING TERMS OF THE CEASEFIRE AND CITY REMAINS MINUTES (ONE HOUR AT MOST) FROM RESUMPTION OF CLASHES AT ANY GIVEN TIME; (B) BOTH SIDES CONTINUING TO REARM AND REPROVISION WITH PUBLIC ATTENTION BEING GIVEN TO VESSEL AT JOUNIEH (PHALAN- GIST) AND A USUALLY-RELIABLE SOURCE REPORTING THAT ANOTHER SHIP OFF-LOADED AT SIDON (PALESTINIAN LEFTIST) WITHIN THE LAST FOUR TO FIVE DAYS; (C) KARAME/CHAMOUN RELATIONSHIP IS PATCHED UP SOMEWHAT, BUT DIFFERENCES, WHICH COULD EASILY SURFACE UNDER STREE, PERSIST, CHAMOUN STILL WANTS ARMY TO ENTER IN FULL FORCE WITH FLAGS FLYINNG WHEREAS KARAME, WHO HAS RECENTLY INCREASED THE ARMY’S ROLE, PERFERS TO INSINUATE IT AS NEEDED AT MORE MEASURED PACE (BEIRUT 12296). OFF-LOADING OF SHIP AT JOUNIEH IS APPARENTLY BONE OF CONTENTION BETWEEN KARAME ON ONE HAND AND FRANGIE/ CHAMOUN ON OTHER. PRIMIN COMPLAINED NOV 6 TO AMBASSADOR THAT ARMY HAS NOT RPT NOT IMPLEMENTED HIS ORDER TO HALT DIS- EMBARKATION OF SHIP’S CARGO. ALL INGREDIENTS OF A FURTHER FLARE- UP CONTINUE TO BE PRESENT AS GOL TURNS ITS HAND TO EFFORTS TO CLEAR AWAY THE FALLOUT FROM RECENT STRIFE. THIS DISPUTE WILL BE SOLVED IN TIME FOR DELIVERIES TO BEIRUU ON NOV 10 RPT 10. 6. ALL AMCITS REMAIN SAFE TO OUR KNOWLEDGE. AMERICAN COMMUNITY SCHOOL IS TOYING WITH IDEA OF OPENING MINI-SCHOOL NOV 10, IF CONDITIONS PERMIT. 1. MEA/BEIRUT SAYS IT HAS NO IDEA WHEN IT WILL BE POSSIBLE REOPEN BEIRUT INTERNATIONAL AIRPORT CLOSED JUNE 27 WHEN MEA BOEING 707 HIT ON GROUND DURING RIGHTIST BOMBARDMENT. AIRCRAFT TOTALLY DESTROYED, KILLING PILOT AND SEVERELY BURNING TWO CREW MEMBERS. MEA POSITION REAFFIRMS PESSIMISM OF MINISTER OF PUBLIC WORKS ADEL OSSEIRAN WHO SAID JULY 6 HE DOUBTED AIRPORT WOULD REOPEN SOON. SEE REFTEL. 3. AIRPORT HAD REOPENED TO LIMITED SERVICE JUNE 23 AFTER BEING CLOSED SINCE JUNE 7 WHEN AREA BECAME ACTIVE BATTLE GROUND OF SYRIAN BACKED SAIQA FORCES VERSUS FATAH AND LEFTISTS. BUT MEA MANAGEMENT AND EMPLOYEES, MANY OF WHOM LIVED FOR MONTHS AT AIRPORT, UNABLE TO REACH THEIR HOMES AND FREQUENTLY UNDER FIRE, APPEAR WITH DEATH AND WOUNDING OF COLLEAGUES TO HAVE REACHED LIMIT OF ENDURANCE. MEA HAS TEMPORARILY TRANSFERRED HEAD OFFICE TO PARIS. 4. TRANS-MEDITERRANEAN AIRWAYS, ONLY CARGO SERVICE OPERATING OUT OF BEIRUT IN RECENT MONTHS, ALSO REPORTED MOVING HEADQUARTERS FROM BEIRUT TO LONDON AT LEAST TEMPORARILY. 5. MEA EVACUATING PERSONNEL VIA ROAD TO DAMASCUS AND MOST HAVE REPORTEDLY ALREADY LEFT COUNTRY. TWO BURNED CREW MEMBERS, ONE AMCIT AND ONE LEBANESE, EVACUATED BY ROAD TO DAMASCUS ON JULY 4 AND FLOWN TO BURN CENTER IN BIRMINGHAM, ENGLAND. CONVOY OF TWO BURN VICTIMS ALSO EVACUATED FIVE OTHER MEA EMPLOYEES. 6. RELIABLE MEA SOURCE REPORTED JULY 6 THAT AIRPORT RUNWAYS STILL USABLE, CONTAINING ONLY EIGHT SMALL RUPTURES DUE BOMBARDMENTS. CONDITION OF RADAR AND CONTROL TOWER EQUIPMENT SUBJECT OF CONFLICTING REPORTS, BUT SAME SOURCE REPORTED JUNE 24 THAT EQUIPMENT STILL INTACT. HOWEVER, IT HAS BEEN DEMONSTRATED SEVERAL TIMES THAT AIRCRAFT CAN LAND AT AIRPORT IN DAYLIGHT HOURS WITHOUT REFERENCE TO CONTROL TOWER. LATEST DEMONSTRATION WAS JULY 8 LANDING OF ICRC DC-6 CARRYING SIX TONS MEDICAL SUUPPLIES. 7. AIRPORT PRESENTLY UNDER CONTROL ARAB LEAGUE FORCE COMPOSED OF SOME 700 SYRIANS, 300 LIBYANS, 500 SAUDI ARABIANS, AND 500 SUDANESE. PERIODIC BOMBARDMENTS CONTINUE. PURPOSE OF ARAB LEAGUE FORCE IS TO SUPERVISE CEASE-FIRE WHICH SO FAR HAS BEEN IMPOSSIBLE TO IMPOSE. AIRPORT WAS PRIMARY RALLY POINT OF SYRIANS ANDLIBYAN ARAB LEAGUE FORCES WHO ACCEPTED CONTROL OF AREA FROM REGULAR SYRIAN ARMY ON JUNE 21. HOWEVER, CONTINUED QUARRELS HAVE KEPT AL FORCES FROM ADVANCING FROM AIRPORT AREA AND JUNE 23 SHELLING SEEN LARGELY LIMITED OFFICIAL USE LIMITED OFFICIAL USE PAGE 03 BEIRUT 06147 130545Z IN RESPONSE TO HEIGHTENED CHRISTIAN FEARS THAT AIRPORT BE USED AS ENTRY POINT FOR ARMS FOR PALESTINIANS AND LEFTISTS. CHRISTIANS ALSO MISTRUST LIBYAN INTENTIONS, HAVING REJECTED LIBYYANS AS LEGITIMATE PARTICIPANTS IN ARAB LEAGUE FORCE. 8. CHRISTIAN ARTILLERY CONTINUES DOMINATE AIRPORT FROM SEVERAL POINTS AND, UNLESS GUARANTEES CAN BE WORKED OUT, IT IS UNLIKELY CHRISTIANS WILL ALLOW AIRPORT REOPEN, ALTHOUGH SOME ICRC AND OTHER MERCY FLIGHTS MAY BE ALLOWED IN. FOR NOW CHRISTIANS QUITE CONTENT WITH JOUNIEH PORT AS SUPPLY ENTRY AND PERSONNEL EXIT PORT. SOME 12 BOATS NOW PROVIDING DAILY SERVICE BETWEEN LEBANON AND CYPRUS. 1. EMBASSY HAS JUST BEEN INFORMED THAT DURING GENERAL SHELLING OF WEST BEIRUT OCT 18, FOUR SHELLS EXPLODED ON AUB CAMPUS ITSELF, PLUS TWO ON ABDUL AZIZ STREET ADJACENT TO AUB HOSPITAL, AND TWO ON BLISS STREET NEAR SAUDI EMBASSY. NO ONE WAS KILLED OR SERIOUSLY INJURED IN AUB OR ABDUL AZIZ EXPLOSION, BUT FOUR PEOPLE WERE REPORTEDLY KILLED ON BLISS STREET. 2. AUB ACTING PRESIDENT COWAN AND DEAN ELIE SALEM BELIEVE SHELLING OF AUB CAMPUS AND NEAR HOSPITAL ON ABDUL AZIZ STREET MAY BE RESULT OPENING OF AUB MEDICAL SCHOOL OCT 18, AND AN INDICATION OF WHAT WILL HAPPEN IF AUB OPENS FULL CAMPUS ON NOV 1 AS SCHEDULED. THEY ARE CONSIDERING DIRECT APPROACH TO CHRISTIAN LEADERS, ASKING THEM TO USE THEIR INFLUENCE TO SPARE AUB/AUH FROM FURTHER BOMBARDMENT. 3. COMMENT: OUR INFORMATION INDICATES THAT SHELLING TODAY (OCT 18) HAS BEEN UNUSUALLY HEAVY AND WIDESPREAD ON BOTH SIDES OF CONFRONTATION LINE IN BEIRUT, AND WE HAVE NO INFORMATION THAT AUB/AUH IS BEING SINGLED OUT AS A TARGET. HOWEVER, COINCIDENCE OF OPENING OF AUB MEDICAL SCHOOL (NO FIRST-YEAR CHRISTIAN STUDENTS HAVE YET ARRIVED) AND HEAVIEST SHELLING AUB/AUH HAS SUFFERED THIS YEAR CANNOT BE IGNORED. REGARDLESS OF REASON, ANY FURTHER SHELLING OF AUB/AUH, PARTICULARLY IF SOMEONE IS KILLED, MAY MAKE IT IMPOSSIBLE FOR UNIVERSITY TO OPEN. CHARGE THEREFORE REQUESTS AUTHORIZATION TO ATTEMPT TO TELEPHONE PRESIDENT SARKIS (WHEN HE RETURNS), FORMER PRESIDENT CHAMOUN, PIERRE GEMAYEL, CHARBEL KASSIS (GUARDIAN OF THE CEDARS) AND LEADER OF THE TANZIM ASAP TO: (A) DESCRIBE RECENT SHELLINGS AT AUB/AUH, (B) EMPHASIZE DANGER TO INNOCENT LEBANESE AND FOREIGN STUDENTS AND FACULTY; AND, (C) SAY HE HAS BEEN INSTRUCTED BY THE DEPARTMENT TO ASK THEM TO USE THEIR INFLUENCE TO PREVENT SHELLING OF AUB/ AUH IN THE FUTURE. 4. IF CHARGE NOT ABLE TO GET IN TOUCH WITH THESE MEN BY PHONE, WOULD PLAN SEND LETTERS ALONG LINES OUTLINED ABOVE. BELIEVE IT WOULD ALSO BE USEFUL IF DEPT COULD ASK AMB GHORRA IN NEW YORK TO PASS SAME MESSAGE TO CHAMOUN. 5. WOULD APPRECIATE REPLY ASAP. 1. (U) THERE HAVE BEEN SEVERAL ATTACKS AGAINST CHRISTIAN INSTITUTIONS IN TRIPOLI DURING THE PERIOD JANUARY 8-9. TWO CHURCHES, MARONITE AND GREEK ORTHODOX, WERE BOMBED ON TUESDAY, CAUSING SERIOUS DAMAGE, WHILE ANOTHER GREEK ORTHODOX CHURCH AND AN EVANGELICAL INSTITUTION WERE DAMAGED IN ATTACKS WEDNESDAY. A CHRISTIAN CEMETARY WAS ALSO BOMBED WEDNESDAY NIGHT. 2. (U) ISLAMIC UNIFICATION MOVEMENT (TAWHIID) HAS ISSUED TWO CONSECUTIVE CONDEMNATIONS OF THE ATTACKS, NOTING THAT TRIPOLI HAS TRADITIONALLY BEEN AN EXAMPLE OF RELIGIOUS UNITY, AND DEPLORING EFFORTS “TO FRIGHTEN THE CHRISTIANS OUT OF THE CITY.” WEEKLY MEETING OF ISLAMIC DAR AL-FATWA WEDNESDAY ALSO CONDEMNED THE BOMBINGS, AS DID BRIG. OTHMAN OTHMAN, DIRECTOR GENERAL OF INTERNAL SECURITY FORCES DURING A VISIT TO TRIPOLI WEDNESDAY. 3. (C) CHRISTIAN NOTABLE AND LEBANESE FORCES CHARTER MEMBER, CHARLES MALIK, TOLD POLOFF THAT FOUR CHRISTIANS HAVE, AS WELL, BEEN MURDERED ON ROADS NEAR TRIPOLI, AND THAT CHRISTIAN RESIDENTS OF AREA FEAR FOR THEIR LIVES. HE SAID THAT “LEBANESE CHRISTIAN COMMUNITY” IS THINKING OF PREPARING A DEMARCHE TO STATE DEPARTMENT ON TRIPOLI VIOLENCE. 4. COMMENT (C): AS ALWAYS IN BEIRUT, LIST OF POSSIBLE PERPETRATORS OF THESE ATTACKS IS A LONG ONE, BEGINNING WITH TAWHIID ITSELF. MANY OBSERVERS ATTRIBUTE BOMBINGS, WHICH COME SOON AFTER RECENT DEPLOYMENT OF LAF INTO TRIPOLI AS PART OF NORTHERN SECURITY PLAN, AS EFFORT TO EMBARASS GOL (WHILE AT SAME TIME INTIMIDATING CHRISTIANS). ELABORATING ON THIS HYPOTHESIS, CHRISTIAN LEBANESE EMBASSY EMPLOYEE FROM KOURA REGION HAS TOLD US THAT MUCH BLAME IS BEING LAID AT FEET OF STILL-ACTIVE COMMUNISTS IN TRIPOLI, WITH RATIONALE BEING THAT LATTER ARE TRYING TO DISRUPT SECURITY PLAN THERE AND PLACE THE BLAME ON TAWHIID “PRINCE” SHA’BAN, WHO RECENTLY BOASTED IN A PUBLIC SPEECH THAT THE COMMUNISTS HAD BEEN CRUSHED IN TRIPOLI. A SIMILAR ARGUMENT, HOWEVER, COULD BE MADE THAT TAWIID’S MAIN RIVAL IN TRIPOLI, THE ARAB DEMOCRATIC PARTY, IS BEHIND BOMBINGS. 1. (C) SINCE THE SMUGGLER’S INN BLAST OF JANUARY 9, THERE HAVE BEEN FOUR MORE BOMBINGS IN WEST BEIRUT, KILLING SEVEN MORE PEOPLE AND INJURING AS MANY AS 80 MORE. IN ADDITION, A LARGE EXPLOSIVE CHARGE PLACED IN FRONT OF THE BUILDING HOUSING THE EMBASSY’S CHIEF POLITICAL SECTION LOCAL EMPLOYEE FAILED TO DETONATE WHEN ITS FUSE EXPLODED SUNDAY NIGHT. DETAILS FOLLOW. 2. (U) THREE PEOPLE WERE KILLED AND 27 INJURED FRIDAY WHEN A BOMB EXPLODED OUTSIDE THE BANK OF BEIRUT AND ARAB COUNTRIES ON CORNICHE MAZRA’ IN WEST BEIRUT. EXPLOSION DEVASTATED THE INSIDE OF BANK, DUG A LARGE CRATER IN SIDEWALK, AND CAUSED EXTENSIVE DAMAGE TO VEHICLES AND OTHER BUILDINGS. 3. (U) THREE BOMBS EXPLODED SATURDAY, KILLING THREE PEOPLE AND INJURING AS MANY AS 60. TWO OF THE BOMBS, BOTH PACKED WITH NAILS, WENT OFF WITHIN FIVE MINUTES OF EACH OTHER IN THE PSP-CONTROLLED MUSSEITBEH AREA WHILE THE THIRD INJURED SIX PERSONS AND DAMAGED PROPERTY ON HAMRA STREET NEAR A PSP CHECKPOINT. 4. (C) EMBASSY POLITICAL SECTION EMPLOYEE GABY AKKAR, A CHRISTIAN, SAID THAT UNLIKE BOMB WHICH DESTROYED HIS CAR LAST MONTH, HE IS CERTAIN THAT LAST NIGHTS ABORTED EXPLOSION WAS IMED AT HIM. HE SAID THAT CHARGE WAS PLACED DIRECTLY UNDER THE BALCONY OF HIS APARTMENT. AKKAR SAID THAT HE IS NOW MAKING PLANS TO MOVE HIS FAMILY INTO THE EAST WHERE IT IS SAFE. 5. (C) COMMENT: LEBANESE PUBLIC FIGURES HAVE INEVITABLY ACCUSED ISRAEL OF BEING BEHIND BLASTS, WHILE THE SYRIAN BA’ATH PARTY HAS SINGLED OUT PRO-ARAFAT PALESTINIANS. JOURNALISTS RESIDENT IN THE WEST VARIOUSLY ATTRIBUTE THE BLASTS TO THE MUR- ABITUN, WHICH THEY SAY IS RETURNING TO THE AREA IN FORCE AND REINVIGORATING THE OLD MURABITUN-PSP FEUD, OR HIZBALLAH,SIGNS OF WHOSE PRESENCE THEY SAY ARE INCREASINGLY DAILY. IN THIS REGARD, U.S. JOURNALISTS DESCRIBED THE QUALITY OF LIFE IN WEST BEIRUT AS HAVING SUNK TO TRULY HOBBESIAN LEVELS OF NASTINESS IN LAST MONTH, WITH THE COMBINATION OF CAR BOMBS AND ARMED ROBBERIES KEEPING MQST PEOPLE LOCKED INDOORS AT NIGHT. THERE ARE PRESENTLY REPRESENTA- TIVES OF ONLY THREE AMERICAN NEWS MEDIA RESIDENT IN BEIRUT (ASSOCIATED PRESS, LOS ANGELES TIMES, AND NEW YORK TIMES); SOME OF THESE ARE THINKING ABOUT LEAVING. 2. THE NIGHT OF MAY 6-7 WITNESSED SOME OF THE HEAVIEST GREEN LINE FIGHTING SINCE THE IMPLEMENTATION OF THE JULY 4, 1984, BEIRUT SECURITY PLAN. AS ALWAYS, IT IS IMPOSSIBLE TO RECONSTRUCT THE EXACT SEQUENCE OF EVENTS. HOWEVER IT APPEARS THAT THE FIGHTING BEGAN AS AN EXCHANGE OF SHELLING (TANKS, ROCKETS, AND ARTILLERY BY BOTH SIDES), THEN ESCALATED INTO BLIND SHELLING OF RESIDENTIAL AREAS IN BOTH EAST AND WEST BEIRUT. THE HEAVIEST FIGHTING WAS APPARENTLY CONCENTRATED IN THE PORT AND RAS AL-NABAH AREAS, WITH SHELLS HITTING THE EASTERN RESIDENTIAL DISTRICTS OF ASHRAFIYAH AND SIN AL-FIL, AS WELL AS VARIOUS WEST BEIRUT NEIGHBORHOODS. SCATTERED ROUNDS ALSO FELL IN THE GENERAL AREA OF AWKAR, RABIYAH, AND NACCACHE, ALTHOUGH THERE IS NO EVIDENCE THAT THESE AREAS WERE SPECIFICALLY TARGETED. 3. ALTHOUGH EXACT FIGURES ARE UNAVAILABLE, IT IS CLEAR THAT CASUALTIES WERE HEAVIER THAN IS USUAL IN GREEN LINE FIGHTING. EMBASSY SOURCES REPORT SEEING UP TO TWENTY-FIVE BODIES IN THE PORT AREA, AND THE LAF REPORTS LOSING ONE KILLED AND TWELVE INJURED. THERE ARE UNCONFIRMED REPORTS THAT THE PSP AND AMAL REQUESTED A CEASE-FIRE FOR 1600 HOURS LOCAL TIME IN ORDER TO RETRIEVE THE DEAD AND WOUNDED FROM THE NO-MAN’S LAND SEPARATING THE WARRING FACTIONS. THE RIZK TOWER IN EAST BEIRUT WAS HIT BY A TANK ROUND, DESTROYING GOL REPEATER EQUIPMENT AND DAMAGING THE ANTENNA OF A GOVERNMENT TELEVISION STATION. 4. AUB SOURCES INDICATED THAT THE UNIVERSITY SUFFERED ONLY LIGHT DAMAGE, ALTHOUGH ONE STUDENT SUFFERED INJURIES REQUIRING HOSPITALIZATION. SCHOOL IS OPEN TODAY, MAY 7, BUT ATTENDANCE IS SPARSE. THIS SOURCE REPORTED THAT THE PREVAILING ATTITUDE AMONG AMERICAN CITIZENS IN WEST BEIRUT IS ONE OF “DEPRESSION.” THEY SEE NO DIRECT AND IMMEDIATE THREAT, SUCH AS OF THE LF OR LAF CROSSING THE GREEN LINE TO ATTACK WEST BEIRUT, BUT RECENT EVENTS HAVE CONTRIBUTED TO A FEELING OF HOPELESSNESS ABOUT THE IMMEDIATE FUTURE OF LEBANON. THIS SOURCE SAID THAT ALTHOUGH AUB AMCIT FACULTY MEMBERS ARE NOT PLANNING TO LEAVE BEIRUT NOW IN RESPONSE TO A PERCEIVED THREAT, MANY ARE PLANNING ON LEAVING LEBANON AFTER THE END OF THE TERM IN LATE JUNE, EITHER BY NOT RENEWING THEIR CONTRACTS OR BY TAKING A YEAR’S SABBATICAL. 5. THE SITUATION ON THE GROUND REMAINS TENSE MAY 7, WITH MOST STORES REPORTEDLY CLOSED IN MUCH OF WEST BEIRUT AND THE ASHRAFIYAH SECTION OF EAST BEIRUT. THOSE SHOPS THAT ARE OPEN ARE MOSTLY OF THE MOM AND POP FOOD STORE VARIETY. THE SITUATION APPROACHES NORMAL IN EASTERN AREAS FURTHER FROM THE GREEN LINE. ALL GREEN LINE CROSSINGS ARE OFFICIALLY CLOSED. 6. COMMENT. IT IS STILL TOO SOON TO TELL IF RECENT OUTBREAKS REPRESENT SPONTANEOUS OUTBURSTS OR ARE POLITICALLY MOTIVATED. WE EXPECT THE SHARP FIGHTING ALONG THE GREEN LINE TO CONTINUE. HOWEVER, DESPITE UNSUBSTANTIATED RUMORS OF TROOP MOVEMENTS AND FEARS OF IMPENDING CLASHES, SUQ AL-GHARB HAS REMAINED CURIOUSLY QUIET. END COMMENT. NOTE BY OC/T: HEADING AS RECEIVED.